According to VTM nieuws website a Malaysian Airlines flight from AMS to KUL has crashed in the Ukraine, near the Russian border. 295 passengers are believed to be dead. Amsterdam to Malaysia aircraft crashed in Ukraine 17jul2014. it may have been Boeing B-777 9M-MRD. what kind of weapon can do that at this altitude ! and the most important of all : Who Profits from Crime? can't we have a flightradar24 trace ? 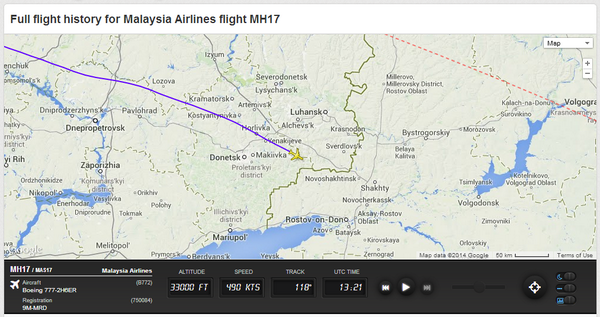 According to Amsterdam Airport flight info, MH-017 was indeed 9M-MRD. Scheduled departure was 12h00, actual was departure 12h14. An adviser to Ukraine's Interior Minister says the plane was shot down by Russian forces. Please note : Avherald.com normally doens't allow to copy/paste articles in full. But because the site is having problems to stay on air for a while now and because it's such tragic news, I have copy/pasted what they had online just now. Acid-drop wrote: what kind of weapon can do that at this altitude ! Both the Russian and Ukrainian Land Forces use this radar-guided medium range missile system. Sky over Eastern Ukraine was shut for civil aviation since July 8, but only for flights below 8,000m altitude. German airline Lufthansa says it has decided to avoid Ukrainian airspace, with immediate effect. It's really not Malaysians year, is it?? Isn't it weird that the Ukrainians already know that something shot down the airplane and that something's exact specifications? Perhaps they shot it down themselves by mistake on a test launch as the thing didn't respond to an abort command? That explains why they are so quick and eager to push the responsibilities to the Russian side? I don't think that the rebels have such weapons systems on Ukrainian territory. The best thing they have must be some shoulder-mounted systems, which will never go as high as 33.000 feet. I also don't think that the Russians would put such a weapon in the hands of non-military staff so close to their borders. That would be foolish. Also, why are commercial flights flying over war zones where aircraft have been shot down recently? Flanker2 wrote: Also, why are commercial flights flying over war zones where aircraft have been shot down recently? Because the airspace was open. The airspace above this region was closed below 7KM but higher than 7KM the airspace was open. Many tweets tell that the airplane was escorted with 2 fighter jets, but not shot down by them. If so, the rebels (or rather their Russian sponsors) have very bright computer specialists. sn26567 wrote: Ukrainian separatists had initially claimed they had shot down another Ukrainian Airforce AN-26, . В районе Тореза только что сбили самолет Ан-26, валяется где-то за шахтой "Прогресс". In the area Torrez just downed plane An-26, lying somewhere in the mine "Progress." The rebels deny it. They say it was not their leader that tweeted, but someone on the ground who tweeted AFTER he saw that a plane had crashed - assuming it was an Ukrain military plane, assuming someone shot it down. How reliable is information from the Ukraian president, not elected through democratic elections? How reliable is information from this president that orders his army to bomb his own people? The best we can hope for aviation safety, is that the investigation is going to proof what caused the crash. Most likely indeed a missile. Launched by who? Military radar photo's (from Russia and Nato) will probably show that a missile was launched seconds before the crash, and the location will point out who did it. But will those who know these facts tell us?